One of the big challenges facing US banks this year has been the drop in trade volumes even as the market continues to climb and retail investors have regained the confidence in stocks that was lost during the financial crisis. Citigroup Inc. (NYSE:C) and JPMorgan Chase & Co. (NYSE:JPM) have both warned investors to expect a 20% or higher drop in trade revenue, while Charles Schwab Corp (NYSE:SCHW) is reportingrecord volumes. The rise of exchange traded funds (ETF), which average about a tenth as much stock turnover as active management, but smart beta strategies in particular (ETFs that don’t simply use market cap weighting) pose a challenge to fundamental investors who now have to take into account the effect that ETFs can have on their own strategies. 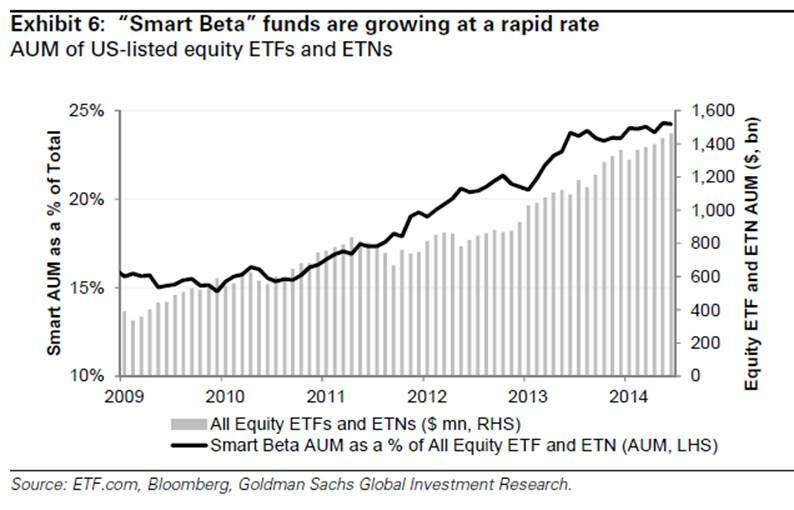 Goldman Sachs estimates that smart beta products now make up about a quarter of assets invested in US equity ETFs, having increased from $65 billion AUM in 2009 to $355 billion today. This growth can have a big impact on stocks that combine low liquidity with strong representation among certain smart beta strategies. Boroujerdi and Graham give the example of Chevron Corporation (NYSE:CVX) and Cincinnati Financial Corporation (NASDAQ:CINF) which each make up about 1.6% of the SPDR S&P Dividend (ETF) (NYSEARCA:SDY) ($13 billion AUM) even though Chevron’s market cap is ten times higher than CINF’s. CINF already has a higher correlation to SDY ETF than Chevron, and anyone thinking about investing in it will have to account for how that can affect its trade volume or correlations with other stocks. While this effect is already noticeable in certain cases, as with Cincinnati Financial Corporation (NASDAQ:CINF) and SPDR S&P Dividend (ETF) (NYSEARCA:SDY) above, it can only get more pronounced as ETFs and smart beta grow in popularity, not only because they will make up a larger share of total AUM in the US stock market but also because of how ETFs dampen trade volumes.